OK, so here’s the recipe which comes from a produce promo card I found at the local grocery store. Once you’ve got the steps down, it’s actually quite easy to make. I highly recommend prepping and measuring all your ingredients before you start the actual cooking (“mise en place”), then it’s just a matter of adding this and that and watching your time. This soup is great served either hot or cool. Prep time: 15-20 min Cook time: 40 min. Heat oil in a large, heavy bottomed pot or dutch oven over medium high heat. Add onions, ginger and jalapeño and sauté 5-7 minutes or until the onions are tender. Your kitchen will smell heavenly at this point. Stir in squash and broth. Bring to boiling. Reduce heat and simmer for 30 minutes or until squash is tender. Add evaporated milk, coconut milk, salt, sugar and paprika; cook 5 more minutes. With a hand blender or food processor, blend the mixture until smooth, scraping down the sides as needed. Serve warm and garnish with sour cream and thyme if desired. I don’t know how big a “medium” butternut squash should be but Cooks Illustrated says not to get one more than 2.5 lbs so I’ll assume it’s about 1.5 lb to 2 lbs. I use 3/4 of a fresh pepper as I found a whole one was too spicy (and I like heat) and distracted from the flavour. Coconut milk can be found with asian food in your grocery store. Since you’re not likely to use the coconut milk regularly, split the remainder into 1/2 cups in baggies and freeze until you need it again. 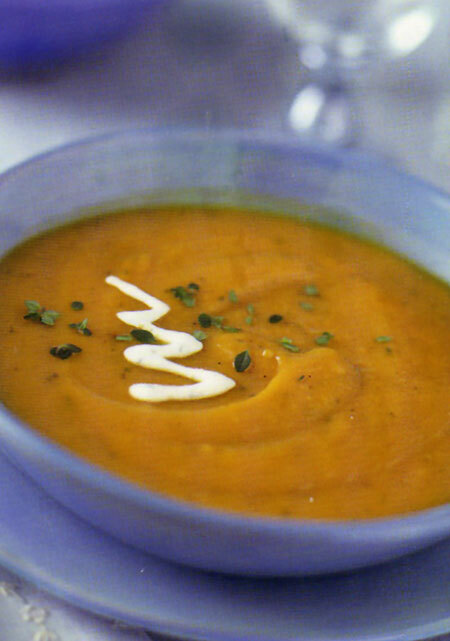 You can make the soup without but it adds a nice smooth undertone to the soup. A “bisque” is a thick, creamy soup made from puréed seafood or vegetables… in case you wanted to know.